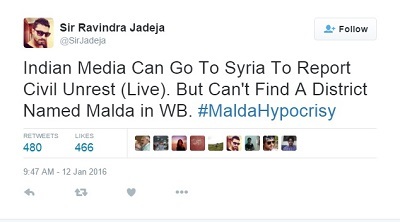 Sir Ravi Jadeja - "Indian Media Hypocrisy on Malda Violence"
Sir Jadeja striking observation: “Indian Media Can Go To Syria To Report Civil Unrest (Live). But Can’t Find A District Named Malda in WB. The Malda Hypocrisy.